For the first time in history, a senior Canadian military officer will help steer the United Nations force in Korea as deputy commander, announced Canada’s Department of National Defense. Lt. Gen. Wayne Eyre will become the first non-American general to hold the post at the United Nations Command since the multinational force was established 68 years ago to thwart communist aggression during the 1950-53 Korean War. Eyre’s new assignment comes as United States President Donald Trump and North Korea’s leader Kim Jong-un prepare for a historic meeting in Singapore on June 12 aimed at denuclearizing North Korea and forging lasting peace on the tension-ridden Korean Peninsula. Eyre is regarded as a rising star in the Canadian military, according to experts. He recently led the Canadian Army in Western Canada as commander of the 3rd Canadian Division in Edmonton and Joint Task Force West. The role of the UNC is to assist maintaining the armistice agreement borne out of the internecine war between the two Koreas, and provide military support alongside the US-South Korea Combined Forces Command. Canada’s Department of National Defense said the country would bolster its contribution to the UNC from the current six to 15 staff officers this summer. 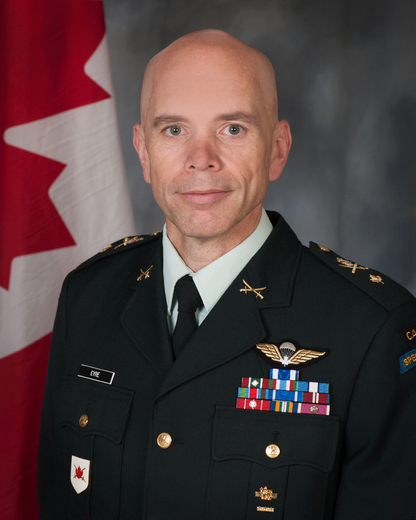 Canada’s top military commander, Gen. Jonathan Vance, said that the larger contribution, including Eyre’s two-year posting, demonstrated the country’s commitment to global peace and security. Ottawa has been stepping up its efforts to guard global peace and security, in part impelled by America’s apparent retreat in global leadership. Canadian Foreign Minister Chrystia Freeland co-hosted a meeting of foreign ministers with former US Secretary of State Rex Tillerson in Vancouver in January. In April, the Canadian military sent a CP-140 Aurora surveillance aircraft along with 40 service personnel to Japan to take part in an exercise aimed at countering North Korean maritime smuggling. According to Murray Brewster, a senior defense writer for the Canadian Broadcasting Corporation News, once a deal is struck to dismantle Pyongyang’s nuclear arsenal and sign a peace treaty, the UNC can play a crucial role, such as securing nuclear material and infrastructure and removing nuclear weapons. The joint force could facilitate international support, monitoring, supervision and oversight of North-South denuclearization arrangements, according to retired South Korean Lt. Gen. Chun In-Bum. Even if the talks floundered, Chun also said, the UNC could continue its mandate, preventing and countering North Korean provocations as a grounded guarantor of security.